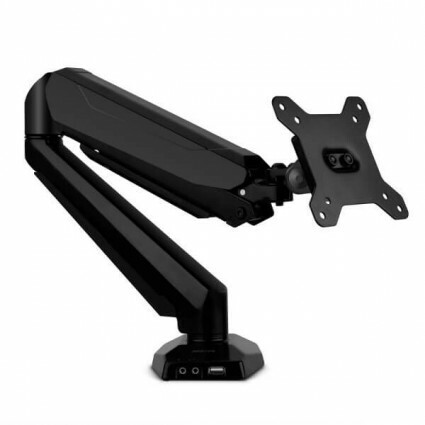 BESTEK LCD screen support is flexible and stable to keep monitor or computer screen sturdy in the best position. The monitor holder comes with USB port, allowing you to charge devices. Mounting arm offers 90° tilt, 180°Swivel and 360° rotation; easy to find the best view angle with gas system; anti-scratch pads well protect your devices. Upgraded gas system and heavy duty arm provide stable support for screens of LCD, panel TV, Plasma, etc. Comes with extra USB ports for charging other devices; provide quick access to flash drivers, audio output; cable management allows moving cables freely and keeps desk tidy. Easy to install it within a few step; can clip the holder on desk or inside the desk.